Below, we suggest a few methods for setting up your integration and payment processor to collect all the information you need. Please know that while it’s definitely possible to use Leadpages in conjunction with many payment processors, some play more nicely than others. Payments are inherently complex, and setting things up will require you to dive into the settings for whichever service you use. Keep in mind, we also have a service-specific guide for PayPal. If you haven’t yet chosen a payment service, we recommend looking for one that offers the features above. Otherwise, please note that some methods below won’t be possible, or will require alternative setup within your payment service to work. Pro: Since you’ll capture opt-in information right away, even if a visitor doesn’t complete their purchase, you’ll have contact information to follow up with them. Pro: While a purchase is the short-term goal, obtaining a visitor’s email or other opt-in information—regardless of their purchase decision—allows you the opportunity to build a relationship, address concerns, and improve your offerings in the long run. Con: There are more barriers leading up to the completion of a purchase since the visitor will have to (potentially) fill out two forms and enter their email twice. Here’s how to get visitors to opt in before sending them to a purchase page. NOTE: This method requires a direct URL (i.e. not just an embed code) to your shopping cart/checkout page. Open a form for your page or pop-up, then navigate to ③ FOLLOW-UP tab in the form settings. 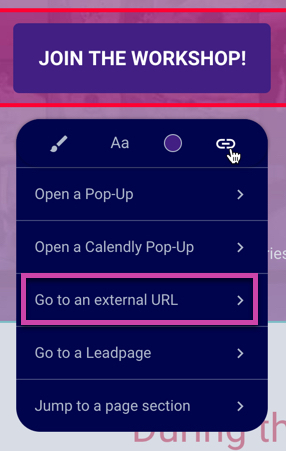 Choose the “Send user to another URL” option, as shown below. Paste your shopping cart or checkout page’s URL in the thank you page field. Save and close your form, then update/publish your page. While the steps above use our Drag & Drop Builder as an example, you can use the same method with standard templates as well. Click here to learn how to customize opt-in setting in the Standard Builder. ​Once you set your form up this way, any visitor who opts in will land on your payment processor or shopping cart URL. That page will essentially replace a thank you page, allowing your visitors to make a purchase there. This method allows your visitors to purchase something before opting in to your list. Once they complete a transaction, they’ll be directed to fill out an opt-in form so you can collect their information. Or, if your payment service doesn’t allow you to customize a confirmation page, you can manually upload contacts to your ESP. Pro: You’ll receive money from transactions more quickly, since the purchase comes first. Pro: Visitors face fewer barriers before making a purchase, since it’s the first thing they’ll do once they decide to buy. Con: If a visitor ends up not making a purchase, you won’t have information to follow-up with them. Con: Visitors may not feel the need to complete an opt-in form once they have their purchased product. To capture a payment first, you’ll need a direct link from your payment processor. That might be a “buy now” button link, or a URL to a shopping cart page. Add a button widget to your page, or use an existing one. Hover over the button and click Add Click Event. Paste in the URL to your payment or checkout page. Find any call to action on your template, then make sure to configure it to link to a URL. Paste in the URL to your shopping cart/checkout page (from your payment processor). Next, choose a method below to make sure you can add visitors to your list after they make a purchase. NOTE: This method requires the ability to set up a thank you page within your payment processor. Please refer to the help center for your payment processor to see if this setting is available. If it’s not, you’ll need to use the manual upload method. In order to capture opt-in information after the purchase, you’ll need to create a separate page with an opt-in form to use as a thank you page in your payment processor. We recommend using a page, or creating a pop-up to use on an existing webpage. TIP: Some services (such as Infusionsoft) provide forms that allow you to collect payments and opt-in data. If you use a service that provides this feature, you don’t necessarily need to set up a thank you page—as you’ll collect customer information as they purchase. Once you’ve created a thank you page with an opt-in form, copy its published URL. Then, paste it in as the thank you page your customers see when they make a purchase. Please refer to your payment service’s help center for details on post-purchase thank you page settings. Using this method, visitors would make a purchase but aren’t required to fill out a form. Instead, you can use information gathered in transactions to manually add new customers to your ESP or CRM. NOTE: This method doesn’t require a thank you page to be connected, and can be done with any payment processor. Keep in mind, some regions have laws and regulations that may prevent you from adding folks to your list without having them fill out a form. We recommend checking local laws to ensure they allow this before proceeding. Once someone makes a purchase, check your payment processor for their information. Note some payment processors allow you to customize the information collected for a given transaction. Then, check with your ESP for instructions on manually adding contacts to a list. From there, you’ll need to copy and paste contact information from your payment service to your ESP.